Got 99 Problems, Are #WindsorProblems One? A new local twitter trend is getting lots of retweets and attention. #WindsorProblems is a new local hashtag spun off from a twitter user (@windsorissues) started on December 15th, described matter-of-factly as “A place where fellow Windsorites can complain about how boring our city is”. 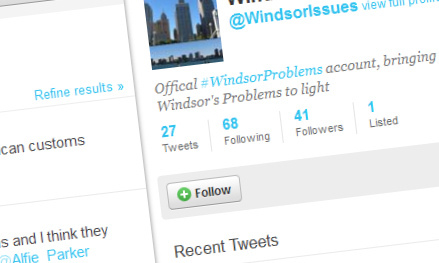 Update: Reader Kim tells us that the “Windsor Problems” idea originated from a tumblr by the same name.